Oh, how I love getting packages like this in the mail! Jewel-toned candies in gorgeous, recyclable packaging? Happy days, my friends. 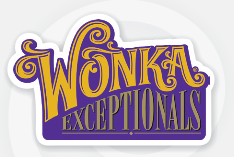 Wonka Exceptionals is a premium line from the candy maker you've known and loved forever. The Chocolate Waterfall bar blends milk and white chocolate, the Domed Dark Chocolate bar features pretty little orbs of milk chocolate nestled in dark chocolate, and the Scrumdiddlyumptious bar (my favorite) in milk chocolate dotted with toffee and cookie pieces and peanuts. The packaging on these new bars features a Golden Ticket contest, with a grand prize of a trip around the world for four! 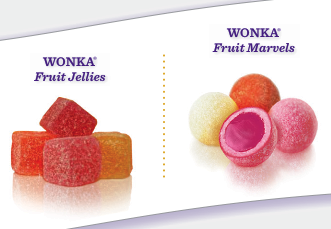 We also received a selection of Wonka Exceptionals Delightful Fruit Jellies and Fruit Marvels, which will be sold exclusively at Walmart locations starting this month. If your family likes gummy candies, they are sure to love these fanciful versions. The Fruit Jellies are little gummy cubes of grapefruit, red apple and goji berry. My kids were more enamored with the Fruit Marvels, which look like hard candy drops but feature soft chewy centers with a crisp sugary shell. We especially loved the clementine orange flavor although the pomegranate and white grape were pretty delicious, too. Disclosure: We received the candy bounty shown in the first photo but no other compensation was given or requested. Our tastebuds are full of integrity and we would tell you if these were yucky but thankfully they were not. And, yes, there are sweets that we don't like. So there. Oh I am jealous..I love Wonka and I want some too! Lucky you and enjoy your treats! There is no way of knowing which direction we are going! Oh wow, I love this! Soren is a gummy candy fiend (his vitamins--we call them gummy candies) so we'll have to look for these. I love that they're doing the whole golden ticket thing. I loved that movie growing up. I debated between the grapefruit and the goji berry and settled on the grapefruit, which are like Haribo Grapefruit but even more refreshing. I wish the flavors were not all made with pear juice, but no biggie if they all taste this good.